As I discussed in my previous post, I spoke at two homeschooling conventions last weekend. The first was in Cincinnati, Ohio and was covered in that post. In this post, I want to discuss the Rideau Valley Home Educators’ Association conference, which took place in the province of Ontario near the capital of Canada, Ottawa. The name of the organization comes from the Rideau Valley, which is a watershed in eastern Ontario. 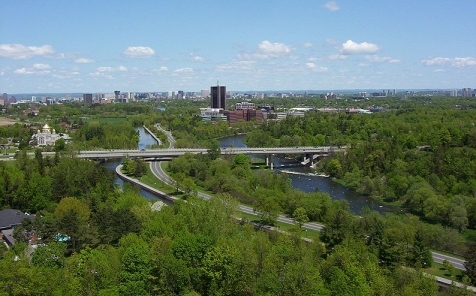 The picture above shows the Rideau river (on the right), which drains the valley and feeds the Rideau canal (on the left) that connects Ottawa to Kingston. Even though it made for a very hectic weekend, I was glad that I had the opportunity to speak at this Canadian conference. I knew it was going to be a great experience when I first arrived in Canada. I was walking from the airplane to the customs area of Toronto (my first stop in Canada) when I got on an escalator. I stood there, riding the escalator, when it suddenly came to a dead stop. This is something my little girl (who is now 35) always wanted to have happen to her, because she had a plan. Knowing that it might never happen to her, I decided to take up the charge and follow her plan. I stood there on the unmoving escalator and yelled, “HELP! HELP! I’M STUCK. HOW DO I GET OUT OF THIS THING?” I thought it was hilarious, but my fellow travelers were barely amused! This put me in an amazingly good mood, so even though I didn’t arrive at my hotel until after midnight, I was happy to get up bright and early on Saturday morning and come to the conference. It’s wasn’t a big conference like the one in Cincinnati, but the venue was completely full. In addition, the crowd was incredibly responsive. 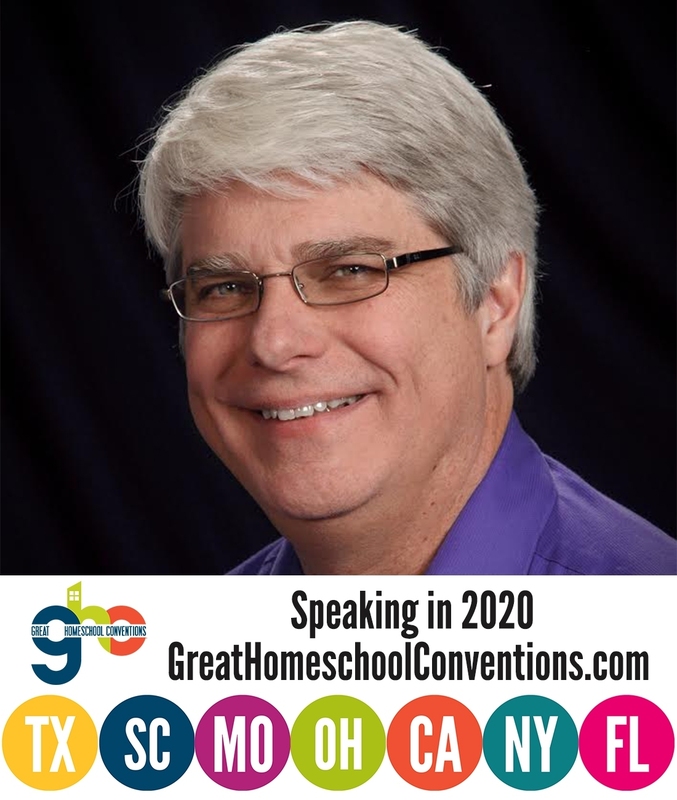 I gave four talks: Homeschooling the Solution to our Education Problem, ‘Teaching’ Science at Home, Why Homeschool Through High School, and Be Open-Minded, but Don’t Let Your Brain Fall Out. Four talks make for a tiring day, but it was well worth it. In addition to speaking, I got to meet the people who run The Learning House, which is the company that sells my new elementary courses in Canada. I was hoping to spend a lot of time at their booth talking with people, but between my talks and the other things that were scheduled for me, I didn’t have a lot of time to do that. Nevertheless, I did get a chance to speak with lots of people both after my talks and during lunch. In fact, lunch was one of the many delightful parts of my day, because I got to spend it with the teens who had come to the conference. We all sat in a big room and ate pizza together, and the conversation was awesome! I learned a lot about what homeschooling is like in Canada from the ones who are actually being homeschooled, and I got to know a lot of fine young men and women. I was a bit distressed, however, to learn about what’s going on in Quebec. A few of the teens at lunch live in that province, which seems to be taking giant steps backwards while the rest of the Canadian provinces are taking tiny steps forwards. For example, I learned that it is now very difficult for homeschool graduates to get into universities in Quebec. That’s unfortunate, because studies clearly show that homeschool graduates are superior university students (see here, here, here, and here, for example). Most Canadian universities recognize this and therefore have specific admissions policies in place so that homeschool graduates can be accepted. Quebec seems to be ignoring the research, which will lead to excellent students traveling away from the province if they attend university. That’s unfortunate for the province of Quebec, but I guess Quebec’s loss will result in gains for the other provinces. The lunch led to a funny thing happening at the conference. The teens were telling me which of my courses they were using, and I told them that if they wanted to throw tomatoes at me after finishing one of my courses, I would completely understand. They all laughed, and I thought that was the end of it. However, right before my final talk, a young lady came up to me and asked if she really could throw tomatoes at me. I told her “yes,” and at the end of my talk, she and another teen each threw a cherry tomato. Neither of them even came close to hitting me, and because they were fresh, they didn’t even break. I thought it was hilarious, although the teens seemed to enjoy it much more than the parents. On a more serious note, there were a lot of great questions, one of which I was unable to answer. The questioner asked whether or not any studies had been done where homeschooled students whose fathers were principally in charge of their education were compared to homeschooled students whose mothers were principally in charge of their education. I told him that I had no knowledge of any such studies, but I would love to see one done! In most homeschooling families, the mother is the one who does the lion’s share of the work, but that’s not true in all families. In fact, I was principally in charge of my little girl’s homeschooling. So, if anyone doing education research is reading this, consider doing such a study. I doubt that there would be a significant difference, but I would love to find out. I was an attendee at the RVHEA convention and my husband and I both enjoyed your talks. I’m glad to hear that you enjoyed your visit! Thanks Tonia! I thoroughly enjoyed my time there. I attended the RVHEA Conference this past weekend and want to thank you for coming out and speaking. All of your talks were not only informative, but reaffirming and encouraging. THANK YOU!!! Thank you, Annie. I am glad that you enjoyed my talks! Loved the conference to my surprise (I always come to these things skeptical;P). We are starting the new Science in the Beginning tomorrow as our fun Friday afternoon thing-to-do! We had been doing crafts, but as much as gluing macaroni on cardboard has some benefits, this in infinitely more interesting and fun (to me at least!) I read the entire book 2 after the conference and learned more in it than I did in my entire highschool career (shows how much I ‘applied’ myself then!). Thank you Dr.Wile — it’s gonna be a good year! I hope it is a great year, Tara! I just finished teaching through the Apologia Physics curriculum for the fifth time since the 2nd edition was published. Thanks for allowing me to participate in the review of the material. I asked my students (4 of them) what did they like best about the course and what they liked least. They enjoy the fact that science was presented and that I tried to relate it with numerous examples from real physics that is happening today (Higgs, cosmology, HEP, Modern medicine, etc.). Then they unloaded on the bad parts, it was the labs that I added to the course. Too many numbers! Too many calculations! I am sure that they would have enjoyed pelting me with tomatoes as well. Thanks for writing the curricula and making homeschool science fun. Whether or not they liked the added labs, Bill, I am sure their physics education was enhanced as a result of them! Thanks for doing peer review on the book. It made the book much better.